The 600-million-year-old stromatolite fossils in Morocco are remarkably well-preserved. Testing the ExoMars drill in this area could help us identify signs of life on Mars. "This site is called Moon 2," says Gian Gabriele Ori of the International Research School of Planetary Sciences (IRSPS). He pauses, looks around, and then says with a laugh, "I don’t remember the reason why." In fact, the wide plain where Ori is standing resembles the planet Mars much more than the dusty grey moon. This valley east of Morocco’s Atlas Mountains has a profusion of red, black and tan rocks scattered about as far as the eye can see. In certain regions in the Morocco desert, you feel as though you are standing on the surface of Mars. Scientists are using the region to test ExoMars mission instruments. The distant mountains on the horizon call to mind the walls of an ancient impact crater as photographed by the Mars rovers Spirit and Opportunity. 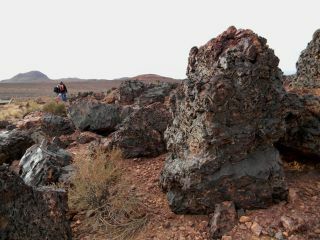 Even the volcanic origin of many of the rocks here is similar to the geological history of Mars. Ori and his colleagues recently brought a group of scientists to this remote region near the Algerian border, where many of the instruments being developed for the upcoming ExoMars missions will be put through their paces. The missions, joint ventures of NASA and the European Space Agency (ESA), will study the Martian atmosphere, geology, and water cycle, and also search for signs of past and present life on Mars. For the first ExoMars mission, slated for launch in 2016, an orbiter will analyze the gases that make up the thin atmosphere of Mars. The orbiting satellite will be keeping a keen eye out for methane – a gas that, on Earth, is often a sign of microbial life but also can be produced by volcanic activity. Previous detections of methanein the Martian atmosphere have generated a great deal of speculation about the possibility for life on Mars. The ExoMars missions could help answer the question of whether microbes are living in protected regions underground on Mars today, and expelling methane gas as a waste product just as some microbes do on Earth. In addition to the orbiter, the 2016 ExoMars mission will send a stationary weather platform to the planet’s surface. This meteorological station will only operate between four to eight days on a battery, but the main point is to have ESA successfully land a mission on Mars for the first time. Aerial view of the Moon2 test site. The capsule will detach from the orbiter, parachute through the atmosphere, and use retrorockets to decelerate before plopping down on the surface. The underside of the capsule will be made of a crushable material that will hopefully protect the contents of the capsule if it lands on large rocks. This landing system is not the same planned for the 2018 ExoMars mission – that will use the same entry, descent and landing system as the upcoming Mars Science Laboratory – but if successful it could be used for later missions. The 2016 ExoMars mission will help the 2018 mission in other ways: The orbiter’s measurements of trace gases in the atmosphere will help scientists select a landing site for the 2018 rovers. Spotting a location where methane periodically appears, for instance, would pinpoint a key place to send the rovers so they could search for the elusive signs of life on Mars. The orbiter also will act as a relay satellite for the dual rovers to send data back to Earth. The ESA-designed 2018 ExoMars rover will be larger then the Spirit and Opportunity rovers currently on Mars, and it will be built to last for at least 218 Martian days. The six-wheeled ESA rover will have a suite of tools at its disposal: ground-penetrating radar, an X-ray deffractometer, infrared instruments, cameras, spectrometers, and a drill to dig beneath the Martian surface. The main goal of the second proposed rover, a NASA design called the Mars Astrobiology Explorer Cacher (MAX-C), will be to collect and analyze samples of Martian soil. The rover would then store these samples so they could be picked up at a later time and brought back to Earth for additional analysis. (MAX-C was recently called out by the National Research Council as the highest priority large planetary science mission for the United States in the next decade.) The follow-up sample-return mission, which would bring home the soil samples MAX-C puts into storage, is currently projected to take place sometime in the 2020s. But before any of this complicated coordination can be played out on Mars, every component of the missions must be tested on Earth, over and over again. Morocco field trip organizer Gian Gabriele Ori discusses the upcoming ExoMars tests. The arid and varied Morocco landscape provides plenty of opportunities for scientists to test the limits of their instruments. IRSPS’s Ibn Battuta Centre is in charge of the test sites, in cooperation with the Université Cadi Ayyad of Marrakech. One of the first tests scheduled this year will be for the laser altimeter for the ExoMars 2016 entry, descent and landing demonstrator module (EDM). "The experiment will consist of a platform with a sort of radar to measure the reflectance of the surface," Ori said. "The instrument will be keptat about 20 to 30 meters from the ground with some balloons, but anchored to the ground." The scientists are planning to perform these tests for several types of surfaces that have close similarities to the Martian landscape. To aid these tests, the scientists will create super-resolution Digital Elevation Models of five or six different areas, using stereo images shot from an unmanned helicopter. The images will be quite detailed, with a resolution of 3 to 30 centimeters per pixel – slightly better than the 25 to 50 centimeters per pixel resolution of the HiRISE camera now on the Mars Reconnaissance Orbiter. The unmanned helicopter also will be used to simulate landing a spacecraft on the surface of Mars, flying at 3,000 meters and descending at several tens of meters per second. In addition, the 2018 ExoMars rover drill will be brought to the different field sites. "We will test the equipment in the field and also the science that can be investigated," says Ori. "The driller will collect samples up to 2 meters of depth and will be the first samples from the Martian subsurface." One planned drill test site, near the town of Ouarzazate, once was an ancient lagoon. Evidence of the lagoon is provided by 600-million-year old stromatolite fossils, free-standing pillars of rock that had been constructed by microbes in their watery environment. Similar stromatolitescan be found being made today at Shark Bay in Australia and other estuaries and ponds around the globe, and the microbes that build them are thought to represent some of the most ancient life on Earth. Although stromatolites have not been found on Mars, evidence suggests ancient Mars was covered by oceans and had all the conditions thought to be necessary for such microbial life to thrive. Rock samples from a variety of other regions in this part of Morocco – volcanic, hydrothermal, mountain, and desert – will be collected so the ExoMars drill can be tested under the controlled conditions of a laboratory. Of course, since life is abundant in even the most seemingly barren deserts on Earth, the samples will not be perfect stand-ins for the rocks of Mars. Neither is the Morocco desert exactly like Mars – there are no Martian versions of Nomadic tents, dromedaries, snakes or scorpions in evidence from Mars rover photos. But the two worlds are not so far apart, either. For instance, one day the 4-wheel drive vehicles that shuttled the scientists to the different test sites became mired in fine desert sand. This scenario was similar to the struggles of the Spirit rover, which often became stuck in sand traps during its travels. Just as NASA operators tried various strategies to set Spirit free, our drivers deliberated on different methods to escape the sand: rocking the vehicle back and forth, pushing from behind, pulling with front tow lines tied to other vehicles, setting metal braces under the front tires. As scientists prepare the ExoMars rovers for Mars, such experiences must sink in deeply. It’s an ironic fact that of all the alien dangers and challenges that Mars poses for future explorers, something as basic as sand can bring even the most high-tech missions to a halt. The Spirit rover is now stuck forever, unable to break free of its final sand trap – a rover no more, but instead a "stationary science platform." Hopefully, by providing real-world challenges for the future ExoMars rovers and other mission components, test sites like the ones in Morocco increase the chance these missions will succeed in the most unforgiving proving ground of all – Mars itself.